Rajabioun, M., Vajhi, A., Masoudifard, M., Selk Ghaffari, M., Sadeghian, H., Azizzadeh, M. (2008). Echocardiographic Measurement of Systolic Time Intervals in Healthy Great Dane Dogs. Iranian Journal of Veterinary Surgery, 03(4), 57-66. Masoud Rajabioun; Alireza Vajhi; Majid Masoudifard; Masoud Selk Ghaffari; Hakimeh Sadeghian; Mohammad Azizzadeh. "Echocardiographic Measurement of Systolic Time Intervals in Healthy Great Dane Dogs". 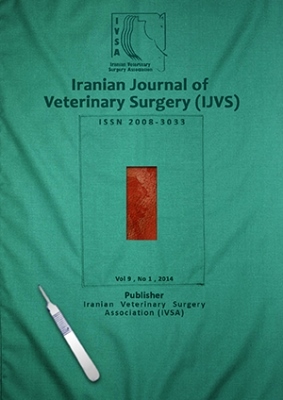 Iranian Journal of Veterinary Surgery, 03, 4, 2008, 57-66. Rajabioun, M., Vajhi, A., Masoudifard, M., Selk Ghaffari, M., Sadeghian, H., Azizzadeh, M. (2008). 'Echocardiographic Measurement of Systolic Time Intervals in Healthy Great Dane Dogs', Iranian Journal of Veterinary Surgery, 03(4), pp. 57-66. Rajabioun, M., Vajhi, A., Masoudifard, M., Selk Ghaffari, M., Sadeghian, H., Azizzadeh, M. Echocardiographic Measurement of Systolic Time Intervals in Healthy Great Dane Dogs. Iranian Journal of Veterinary Surgery, 2008; 03(4): 57-66. 1Department of Clinical Sciences, Faculty of Veterinary Medicine, University of Tehran, Tehran, Iran. 2Department of Clinical Sciences, Faculty of Veterinary Medicine, Islamic Azad University- Karaj Branch, Karaj, Iran. 3Tehran Heart Centre, Faculty of Medical Sciences, Tehran University, Tehran, Iran. 4Department of Clinical Sciences, Faculty of Veterinary Medicine, Ferdowsi University of Mashhad, Mashhad, Iran. Objective- to determine the range of systolic times intervals using Pulsed-wave Doppler and m-mode echocardiography in normal, healthy Great Dane dogs. Design- Descriptive study. Animals- Thirty healthy Great Dane dogs. Procedures- This study examined 30 clinically healthy Great Dane dogs by the twodimensional, M-mode and Pulsed-wave Doppler echocardiography. The dogs were awake and unsedated. The following parameters were measured on the both Pulsed-wave Doppler and M-mode echocardiographic images: pre - ejection period (PEP), left ventricular ejection time (LVET), ratio of PEP to LVET (PEP/LVET) and the total electrical-mechanical systole (QAVC). Acceleration time of aortic flow (AT) was also measured by Doppler mode. Results- The following values have been acquired: PEP = 0.067 ± 0.010 s; LVET = 0.188 ± 0.011 s; QAVC = 0.254 ± 0.016 s and PEP/LVET = 0.354 ± 0.054 measured by Mmode echocardiography and PEP = 0.062 ± 0.009 s; LVET = 0.193 ± 0.007 s; QAVC = 0.256 ± 0.011s; PEP/LVET = 0.323 ± 0.051 and AT = 0.080 ± 0.107 s measured by Doppler echocardiography. Conclusion and Clinical Relevance- On Doppler mode, there was a significant correlation between the body weight and PEP and PEP/LVET. M-mode echocardiography showed significant correlation between the body weight and body surface area and QAVC. Results of this study revealed the importance of determination of breed-specific echocardiographic parameters and indices, and evaluating of measured values with range using same method for accurate diagnosis.